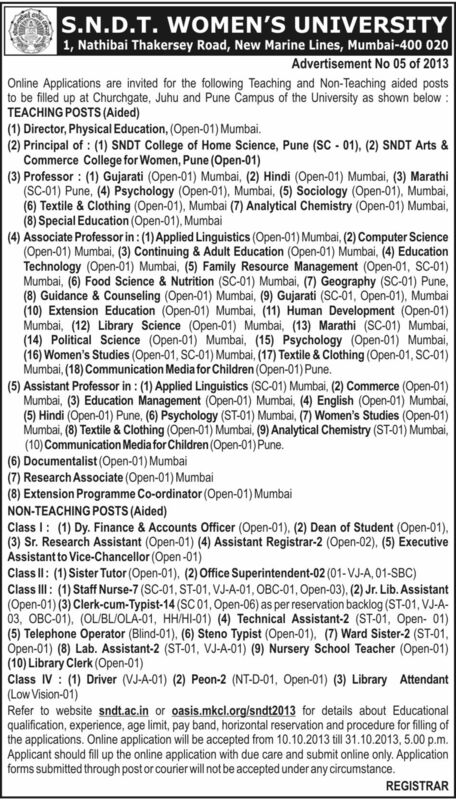 Shreemathi Nathibai Damodar Thackersey Women’s University (SNDT) :- Shreemathi Nathibai Damodar Thackersey Women’s University (SNDT University) has posted employment notification for the recruitment of 91 Teaching & Non Teaching Posts. Eligible candidates can apply through Online on or before 15-11-2013. Eligible candidates can apply through online and register from the web site http://sndt.ac.in from 10-10-2013 to 30-10-2013 and fill the remaining application form after paying the application fee on or before 15-11-2013.